Immediately after the UN's decision on the partition of Palestine into one Jewish and one Arab state in November 1947 Arab gangs began attacking Jewish communities all over Palestine. The Arab World made clear its determination to destroy the Jewish state, the moment it was declared. As Britain prepared to pull out its last troops, Jewish and Arab underground militia fought to position themselves most favorably in anticipation of the imminent Arab invasion. The prospect of war made tens of thousands of Palestinian Arabs, including most of the Arab elite, leave Palestine. The intensification of the fighting, as the expiration of the mandate approached, along with circulation of rumors of both actual and fictitious Jewish attacks on Arab villages, further accelerated the flow of refugees. Before the war itself had really begun, around 175.000 Arabs had already left Palestine. On May 14, 1948 Israel's first prime minister, David Ben-Gurion, proclamed the establishment of the new Jewish republic. The next day the joint armies of Egypt, Jordan, Syria, Lebanon and Iraq invaded the Jewish state. Measured by firepower and military equipment at the outset of war the Arabs were by far superior to the Israelis. But lack of coordination and internal strife between the Arab governments, along with the higher morale and better organization of the Israeli troops, caused the war to turn in Israel's favor. When the final cease-fire came into force in the spring of 1949, the Israelis con-trolled about 40% more land than proposed by the UN partition plan. 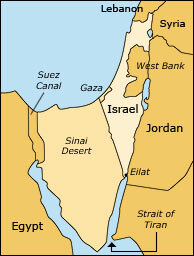 Egypt and Jordan occupied the Gaza Strip and the West Bank, respectively. The projected Arab, Palestinian state never materialized. But it was also never requested, neither by the Palestinian Arabs, nor by the rest of the Arab World. Even though Israel's Arab neighbors all signed armistice agreements with Israel, they didn't recognize the Jewish state's right to exist. homes during the fighting in 1948. During the fighting many Palestinian Arabs fled or were driven from the areas, which came under Israeli control. Around 300.000 fled to the neighboring Arab countries, while approximately 420.000 ended up in refugee camps in the Arab occupied parts of Palestine. The vast majority fled out of fear of the advancing Israeli forces. But in certain places Arabs were forced from their homes by Israeli troops. The Egyptian and Jordanian controlled areas - including the Old City of Jerusalem - were ethnically cleansed of Jews. survived the European Holocaust. In reaction to the founding of Israel, Jews in Arab countries were subjected to an unprecedented level of violence and persecution. Israel launched a series of spectacular operations, evacuating hundreds of thousands of Jews from Yemen and Iraq. Most of Syria's and Lebanon's Jews also fled to Israel, and later Jews arrived from Egypt, Tunesia, Algeria, Libya, Morocco, Iran og Turkey. A total of around 650.000 Jews fled from various Muslim countries to Israel. In stark contrast to Israel's reception of over a million Jewish refugees, the Arab countries - with their far greater capacity for absorption - made no effort whatsoever of integrating the roughly 720.000 Palestinian Arab refugees. To the contrary, they were strictly confined to refugee camps, serving as a political tool in the ongoing fight against Israel. In the years following Israel's first war both Egypt and Jordan supported attacks by irregular forces across the borders from the Gaza Strip and the West Bank into Israel. The targets were usually Israeli civilians. In respons Israel conducted systematic retaliatory raids against the bases in Gaza and the West Bank, from where the attacks were launched. a defense alliance with Syria, and the Soviet Union supplied both countries with large amounts of modern weaponry, far exceeding Israel's military capabilities. In an official declaration Nasser now claimed to posess sufficient military power to destroy Israel. Under pressure, both militarily and economically, Israel wished to extract itself from the Egyptian stranglehold. And when Nasser in 1956 threatened British and French interests by nationalizing the Suez Canal, the two great powers supported Israel's invasion of Gaza and the Sinai Desert, hereby putting an end to both the terror attacks and the blockade of Eilat. British and French forces bombed Egyptian airfields and occupied the area around the Suez Canal. The international community, headed by the United States pressured England, France and Israel to withdraw its forces. A UN force was established in order to monitor the demilitarization of the Sinai and Gaza, and the US guaranteed Israel's future access to the Red Sea. The last Israeli troops were pulled out in March 1957.